Fighting comparison is definitely easier said than done, but possible with the right attitude. It's easy to get caught up in who's doing what, meeting up with whom, and going to what events but it's all just a distraction from your goals. Whether you want to lose weight, finish school, or build your own business - the thing that will take you to your next level is focusing on yourself and only competing with yourself. Social media has made it harder than ever to do that, when all you're seeing on a daily basis is someone's highlight reel. Social media allows us to capture our best moments, thoughts and adventures and recreate them online as a complete picture of our lives. Whether your goals are professional or personal, comparison will be thief of all joy, and progress. This may seem very obvious, but not everyone is racing against themselves only. What this means is that instead of trying to beat someone's record, or one up them - just focus on elevating from where you were previously. If you made $20,000 in sales last year, try making $30,000 instead of making what someone else made. Celebrating your wins means recognizing when you're in a better place today, than you were yesterday. You won because you've progressed, on your own accord. If you are having trouble feeling proud about where you are on your journey, try comparing your life now to your life a year ago. What's changed? What's new and positive? There's no room for hate when there's nothing but love in your heart. Supporting others gives you an opportunity to root for the success of others and understand that it's not stopping success from coming your way too. Just because another woman in your industry is doing well that doesn't mean there isn't enough to go around. Another woman's success should inspire you to work harder so you two could collaborate in the future. Showing support without wanting anything in return can go a long way. Nothing worth having ever came easy, for anyone and you have to acknowledge that. Ten years of consistent, hard work makes people look like an overnight success. Those who get lots of new opportunities makes it look like they never get told no, but it's quite the opposite. Those who don't ask, don't receive and although you will get a lot of no's on your journey, the one yes you get can change your life. Appreciate where you are now while still working toward where you want to be, it will make you appreciate it all much more. Also understand that the people you look up to also went through the same thing; read their stories and be inspired by them! Being yourself can get you very far these days. There are very few things that no one ha done before but the people who make a name for themselves are the ones who do it their own way. There a hundreds of bloggers, YouTubers, influncers, etc., but what will create a lane for you is being your authentic self. We all have friends, but we go to different friends for different things. There a millions of places we can buy our clothes but each store has something unique to them. Everything you may think makes you undesirable or an outcast is the very thing that is going to make you stand out in the crowd. Accept yourself for who you are and embrace your differences. The playing field for success is becoming more even, in some ways. For example, social media has given people a platform to showcase their work and who they are, thus creating exposure and opportunities for themselves. We all have the same 24 hours in a day and most of the same tools online that can help us connect with the right people and show our stuff. Whenever you start to feel down about your progress and start comparing, think about what the other person has that you think you can't have. You have the power to outwork whoever is your "competition", and there probably are tools you can leverage to level the playing field. Use everything to your advantage because that's how you're going to get ahead. 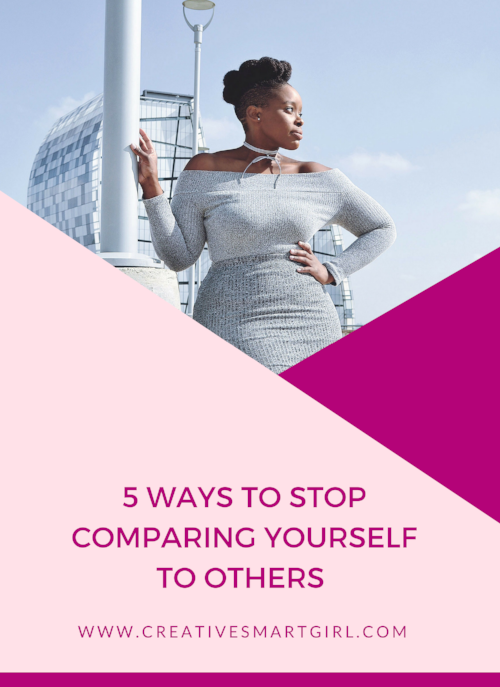 How do you combat comparison?